Now that you have sorted out how you want to teach and how your child learns, it’s time to find curriculum! This is my favorite part of planning for a new school year. I can look at curriculum all day long. There are so many wonderful programs, and new ones come out every year. So first things first, let’s talk about a common new-homeschooler pitfall: Your friend uses this big, expensive, wonderful, detailed program. Her kids are happy, she loves it, and she tells you it’s the best thing on the market. You go to the website, and they tell you, it’s the best program on the market. It costs about 1300 dollars for ONE child, and you have three. How much teacher prep does it involve? Is it “open and go” or will you need to gather supplies, schedule activities or spend the afternoon cutting and assembling? Does the child work independently, or are you teaching the whole program? How much time will it take? Do you have time for it? Does it fit your child’s learning style? Is it complete, or are there gaps you will need to fill with another product? Is it in a format you can teach- is it scripted, or does it give you guidelines? Take a close look at the teachers manual to make sure it’s a good fit for you. I tell a lot of my new homeschooler friends to buy just ONE piece at a time. If you are looking at a full curriculum program (like Tapestry of Grace or Moving Beyond the Page) see if you can buy just one unit, or one semester before committing to a full year program. I have put together a list of curriculum by learning style, and by educational philosophy to help you get started on your search for a program. This list is in no way everything on the market, they are just programs I have either used, or heard tons of wonderful things about over the years. My favorite place to research curriculum and look for programs is on the Well Trained Mind Forum– these ladies have seen everything out there, and will be happy to give you the pros and con’s or even compare different programs. Use the search function on the board to find answers to just about any question you can think of! I use a printable budget planner when choosing curriculum- you can download your copy in our Printables Store. (The other forms are used in our Scheduling 101 series). First, print off one copy of the yearly budget form per child, and determine how much you are willing to spend per child for their grade level. I always start with what I deem the “most important” curriculum first- the three R’s. I research those programs first, and plug in my top pick, and subtract their cost from the Budget in the running balance column. Once the three R’s are done, I can look at exactly how much money I have left to purchase the rest of what I need. I find a science program next, and then history- again subtracting the cost as I go along. I continue on with the cost of character education (and/or religious studies), art and music. In our yearly budget, I also calculate in the cost of club memberships (like scouts or 4H) and sports fees, as well as have a budget for books and art supplies. A lot of the time when I am working this budget, there really isn’t much left over for sports, clubs, books and crafts- you can swap one of your “top pick” programs for a second choice program, or, see if there is a place where you can save by buying a new program used. As you are using this worksheet, keep in mind the above questions. I know that I can’t always teach each subject, so in our home, I choose self-teaching computer or DVD based programs over parent lead programs. I also use workbooks for some topics that can be done independently, so I have time to teach each child. After I have all my choices down and it “looks good on paper” I move over to the Shopping list form (download yours in the Free Homeschool Planning Pack). On this page, I list the program, the new price, and where I can purchase it new, and then list the TOP price I would be willing to pay for that same program used. I also list what date I need to either find it used by, or just cave and purchase the program new. I keep this list near my computer, so when I see programs pop up on used curriculum forums, I can see at a glance what I need, how much it was worth and what I was willing to pay. My favorite place to purchase used curriculum are the Well Trained Mind Forum. 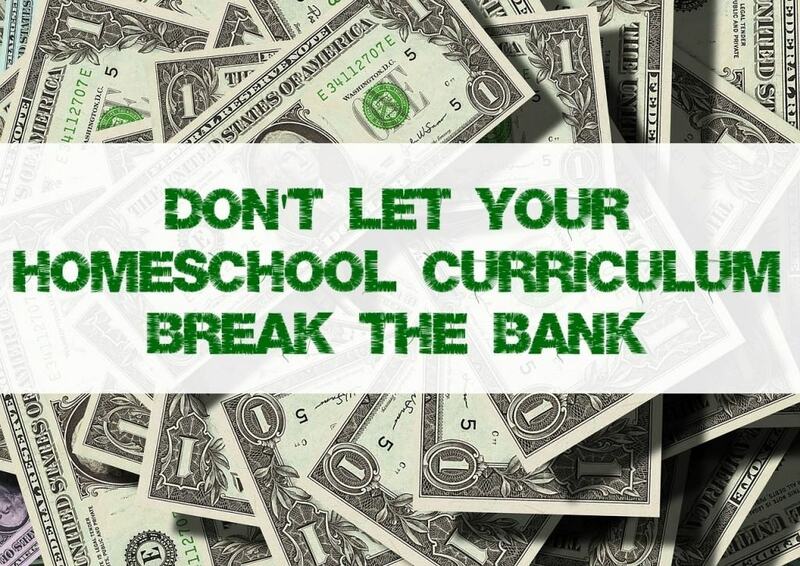 I have only been “burned” once buying curriculum, and it’s because I did not verify I was purchasing from a smoke free home. The book smelled like an ashtray. Now, I always ask. This was only ONE dud though, in probably close to 50 used purchases. If you have a specific program in mind, there are often Facebook groups for each curriculum where members sell old levels to each other for good prices. Don’t be afraid to look for a deal- but make sure you ask to see a picture of the product, pay to get it sent insured and tracked, and ask all the questions you can think of. Paying with PayPal is a good idea also (click “purchasing goods” and never “sending a gift”) because they have a dispute policy and give you some buyer protection. I use the used curriculum purchase record to track my used purchases (Also in the Free Homeschool Planning Pack)- it helps me keep a record of what I bought, when, from whom, and what condition they had said the book was in. That’s it for this week! I hope you have a great time planning curriculum for your kiddos! 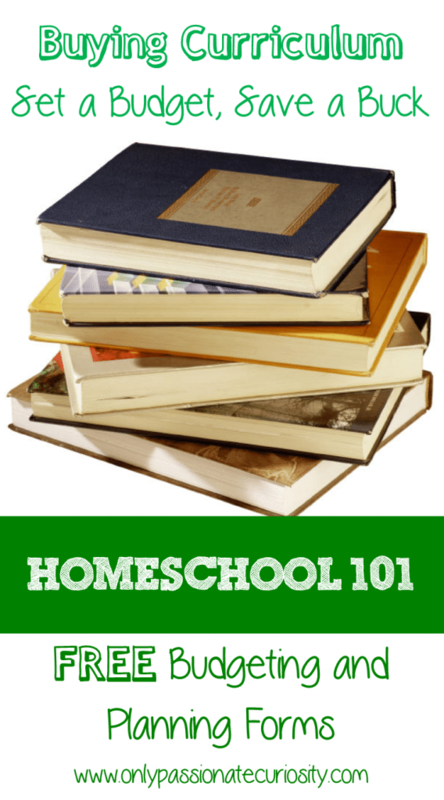 This post is #4 in a series of 6 on the topic of “Homeschool 101”. I just happened upon your Blog and I love it. I am new to Homeschooling, I have a love hate relationship with it. I love being with my kids, but hate it because I spend hours doing the curriculum. The curriculums that I can buy are way out of my families budget. Like you, I have 3 children and one child is extremely gifted a 7 year old in 5th grade ( so I never know what I need to get him!). So I make my own and I use as many free resources as possible. For my daughter I use Magic School Bus and Liberty kids and watch it to make sheets and tests for the next week. Also, our library is fantastic, has homeschool books for every subject that I can take out for the entire year and just use those. And even with all that, I am still looking for more and your site is very helpful. I am going to try your “study independently” guide. My son likes everything one-on-one, but he can’t have that with his brother and sister needing more educational guidance. I hope it works!! Thanks again! I love shopping for curriculum with a budget! Thrifting and deals is all part of the fun! Thanks for the budgeting form, it is fabulous! Great tips! I needed this advice years and and hope what you share makes a difference for others. Great things to keep in mind. Price is always the number one obstacle within our purchasing so second hand items are a great hit with us. Being on the TOS Crew has helped bless my family greatly. I would also through in that I never look at anything to come in to my home that doesn’t fit someone’s learning style. Huge waste of money. Which was something I had to learn as a newbie years ago I finally had to understand I’m not the one learning my kids are lol… But I still learn way more than I ever thought!! Curriculum planning is my favorite time of year. Well besides buying. I’ve been doing it long enough that I pretty much know what works for us but I’m not afraid to change it up if something stops working. Great advice – I love the idea of having a tracking form for purchases. So simple, yet so helpful. Nice post! But I think there is an element even more important than your child’s learning style to take into consideration- you need to think about your teaching style. This year, we wrapped up our first year of HSing, and I discovered that I CANNOT use scripted programs. I want to have a scope and sequence, but I want to figure out the details myself. Other people may need the opposite. Any program that is taught by someone comfortable with the program will automatically be more effective than a “superior” program taught by someone who either doesn’t like it or doesn’t understand how to use it best. I totally agree, Monica, that is SUPER important. I added a note for it, thanks! Personally, I use a few scripted programs, and like them. Most of the time we don’t use the script at all, but it gives me an idea of where the conversation should go. I don’t use any that really require sticking to it- if it did, it would never, ever work for me!